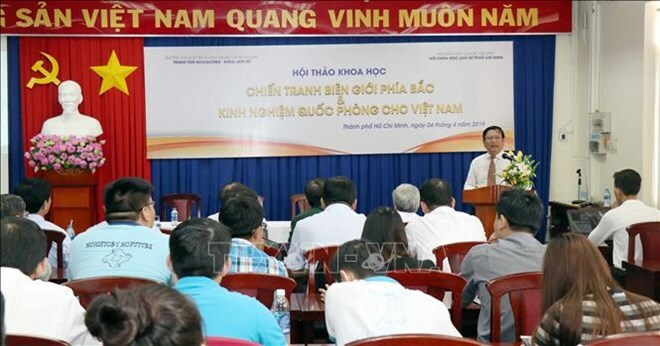 HCM City (VNA) – The northern border defence war in 1979 and Vietnam’s defence experience were the main themes of a scientific symposium held in Ho Chi Minh City on April 4. On February 17, 1979, China launched a large-scale attack on Vietnam’s territory along all the northern border line shared by the two countries from Phong Tho (Lai Chau province) to Mong Cai (Quang Ninh province). Exercising their legitimate right to defence, Vietnam’s army and people fought back with great fortitude. Suffering heavy losses without achieving the attack’s initial aim, and being condemned by international opinions, China withdrew all its military forces from Vietnam on March 18 that year. Former Director of the Vietnam Military History Institute Vu Quang Dao said that various lessons can be drawn out from the northern border defence war, including the importance of upholding national independence and remembering President Ho Chi Minh’s teaching, that “nothing is more precious than independence and freedom”.